This beguiling Sonnet is a contemplation of life in its most recondite state. Undoubtedly, its most bemusing characteristic is that there is no explicit encouragement to procreate from the persona. A change of strategy perhaps to aid in trying to coax the Fair Youth into bearing offspring. Line 1 reflects an extensive rumination on the concept of life and growth. It is also the beginning of the comparison between the Youth and all else that stake a claim to life. It is as if Shakespeare laments the temporary nature of perfection, "... in perfection but a little moment," and he does so with good reason as it becomes apparent that like all else, the current state of the Fair Youth will inevitably depreciate. Just as in 'AS YOU LIKE IT' Act 2 Scene 7, Shakespeare likens the world to a stage in Line 3 not as a way to debase the roles of all and sundry but rather to allude to the irrevocable importance of the Fair Youth sticking to his script (procreating) as failure to deliver would mar the whole performance ( world as prescribed by the prevailing metaphor). In true stage fashion, there is a director(the stars) orchestrating every movement. 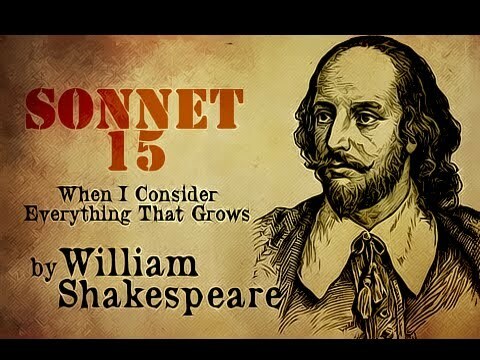 However, it seems a tad bizarre that Shakespeare should acknowledge the existence and power of 'fate' or at least some pre-determining force given the seemingly heated criticism of such in Sonnet 14. He might be going so far as to allude to the existence of a 'God' from line 6, "cheered and checked ev'n by the self-same sky" apparently therein the heavens lies a power as is common belief among all religious congregations. Just as perfection appears, the wears of life pervade its actuality casting the reader back to line 2. The beauty in its abundance is spent gradually, "... wear their brave state out of memory," to fade away into oblivion if an heir is not to be found. The stakes get even higher against the Fair Youth as it isn't just time lying in wait but also 'decay' in its boldest form. Though fairly common in Shakespeare's writing, the image of day to sunset further augments the concept of the receding of Youth into nihility. The final couplet is probably the most significant of any other thusfar as Shakespeare instigates a totally new view to the Sonnets. Instead of them just being pleas for procreation, the persona is using the Sonnets to perpetuate in print the allure of the Fair Youth. Was this procreation all just a plea for the Fair Youth to be a willing part of these writings or they were to write too or the Sonnets are in fact the procreation? We are all left to wonder.